I don't know whether I will be organised enough to keep posting each day but I am going to try to. This fabric is very very exciting for me. I had my first go at tea dyeing for these gingerbread men and I love the result. This was a white 25ct evenweave that I cut off Maskerade Pale Dawn the piece I bought was way too big. 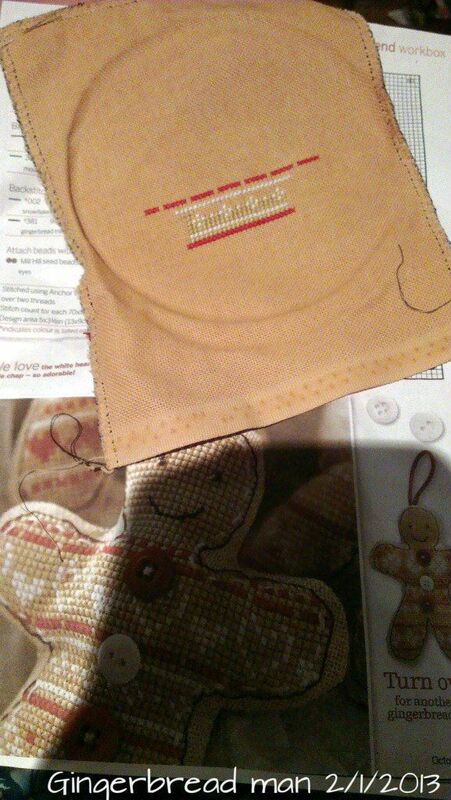 I have 3 pieces dyed from this batch for the three gingerbread men. I will experiment with different amounts to get lighter browns. On other awesome news I went to see the hobbit and WOW!!!! I loved what they did with it. Such an awesome way to go with it. I love the way they hint at the story for LOTR. It gives you an idea what really turned Saruman (he didn't believe and was already feeling defeated before the fight began.) Then the battles were awesome. You can definitely see why they need three movies as they have barely touched any of the book. I loved reading the Hobbit but I didn't enjoy it as much as LOTR because I found it too empty of the detail that I love in LOTR. This movie has added some of that detail. It gave more back story and information. I am going to have to go through LOTR and see what was in the appendixes that may give a bit more information. As always the MUSIC was STUNNING! Just as awesome as last time but different. There were elements the same. When the ring was in play the music had some of the same elements. The music in Hobbiton was the same as well. There were the same elements in many greetings that I loved. Basically I have to get my hands on this soundtrack. The costumes were wonderful and the what they created took from LotR and made it better. I can't wait until next year! I would love to hear what anyone else thought of the Hobbit particularly if you are a big Tolkien fan. Nice start on the gingerbread man! I loved The Hobbit too - I liked how the dwarves were characterized, and how Thorin (who I'd always pictured as a rather stuffy old gentleman) is instead a charismatic handsome warrior. The special effects and battles were superb, and the riddle scene was quite as chilling as I'd imagined it from the book. I didn't like that the head goblin in the Misty Mountains was way too cartoonish, rather than frightening as I'd figured him to be. I suppose there had to be a contrast with Azog, who obviously plays a much greater role in the films than in the book, but still... In any case, I can't wait for the next film. Really intrigued by the tea dying...it looks great! Not a Tolkien fan, but am a big Richard Armitage fan so am dying to see The Hobbit, but may wait until DVD...did you have any issues with the visuals of the film making you sick? I was really lovely to my hubby and let him take our son to see the Hobbit! I can't do 3D because of my eyesight so I knew he'd appreciate it more. They both loved the film! If you drop me your address I have a (very) little something I can post to you! What fun to dye your own fabric. The Hobbit has alwasy beena favourite book from a teenager. Your fabric dying came out great! These will be wonderful gingerbread men!